Just a heads up: This isn’t the kind of post that contains answers to your problems. It is, unfortunately, the kind of post that contains a lot of the steps that I took to fix a problem, without much information about the order in which I performed them, why I performed them, or what they did. All that I can tell you is that after doing some or all of these things in an arbitrary order, stuff seemed to work better than it did before. It’s funny how these posts often seem to come about when trying to get hardware related things working. I distinctly remember writing one of these about getting hardware compositing working on Debian. This one is about getting reliable audio on Kubuntu 9.10. You see, I have recently been experiencing some odd behaviour from my audio stack in Kubuntu. My machine almost always plays the startup/shutdown noises, Banshee usually provides audio by way of GStreamer, videos playing in VLC are sometimes accompanied by audio, and Flash videos almost never have working sound. Generally speaking, restarting the machine will change one or all of these items, and sometimes none. The system is usuable, but frustrating (although I might be forgiven for saying that having no audio in Flash prevents me from wasting so much time watching youtube videos when I ought to be working). Next, go to System Settings > Multimedia, and set PulseAudio as the preferred audio device in each of the categories on the left. Finally, restart the machine a couple of times. If you’re lucky, once you restart and run pavucontrol from the terminal, you’ll see a dialog box called Volume Control. Head over to the Configuration tab, and start choosing different profiles until you can hear some audio from your system. Also, I found that most of these profiles were muted by default – you can change that on the Output Devices tab. If one of the profiles works for you, congratulations! If not, well, I guess you’re no worse off than you were before. I warned you that this was that kind of post. Colin Guthrie – I spoke to this guy on IRC, and he was really helpful. He also seems to write a lot of stuff for the PulseAudio/Phonon stack in KDE. His site is a wealth of information about the stack that I really don’t understand, but makes for good reading. Musings on Maintaining Ubuntu – Some guy named Dan who seems to be a lead audio developer for the Ubuntu project. Also a very interesting read, and full of interesting information about audio support in Karmic. A Script that Profiles your Audio Setup – This bash script compiles a readout of what your machine thinks is going on with your audio hardware, and automatically hosts it on the web so that you can share it with people trying to help you out. A Handy Diagram of the Linux Audio Stack – This really explains a lot about what the hell is going on when an application tries to play audio in the Linux. 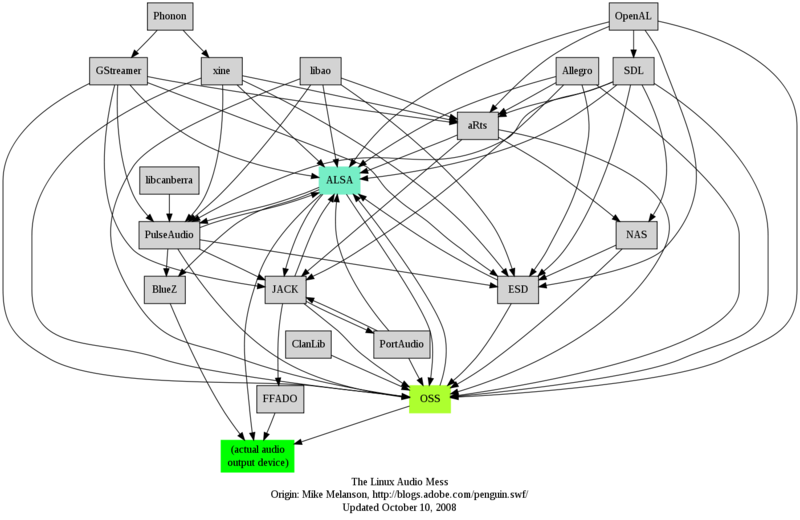 What the Linux Audio Stack Seems Like – This diagram reflects my level of understanding of Linux audio. It also reminds me of XKCD. Ardour – The Digital Audio Workstation – In the classic tradition of running before walking, I just have to try this app out. Glad you got your kde sound to work. The one thing that I did find amusing is the irony of having to use pulse-audio in kde to get the job done. There are so many Ubuntu(gnome) users that hate pulse-audio as it is often a mess on some hardware. 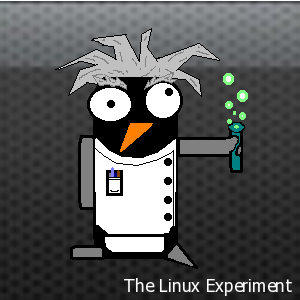 One such example from Patrick Davila of Linux link tech show podcast and host of mythcast. Yeah, everything works great now, including sound from inside of a WinXP instance running in Sun Virtual Box. I still need windows for a few business related things. To be honest, I’m not sure that I want to open up the whole PulseAudio/JACK can of worms. In my research, I learned a lot about both systems, and see the fight as one of those timeless battles, like emacs vs vi and gnome vs kde. All I can say is that I tend to agree with the maintainers of PulseAudio about it not being properly configured in distributions. In my case, you can see that all it took to get my audio working was to install a PulseAudio front end, and choose the correct audio profile after a reboot. Now why wasn’t that front end present in Kubuntu and available from the System Settings > Multimedia dialog? I’d love to know. Ah yes, the timeless battle for second place. nano ftw.